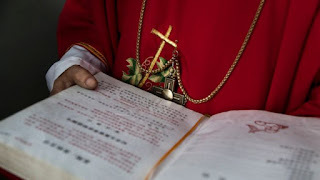 The Vatican has expressed "grave concerns" for one of its bishops who was detained after being "forcibly removed" from his diocese in China. Chinese Catholic bishop Peter Shao Zhumin was seized by authorities in May, Vatican spokesman Greg Burke said. The cleric's family has been given no information on the reasons for his removal or his current whereabouts. Relations between the Vatican and China have been strained by disputes over who can appoint bishops in the country. Mr Burke said he was "profoundly saddened" by the situation involving the detention of a bishop from his diocese in Wenzhou, in China's southeastern Zhejiang province. He said the incident was detrimental to efforts to reach an understanding with the Chinese authorities on the status of the Church in the communist state. "The Holy See hopes that Bishop Peter Shao Zhumin may return as soon as possible to his diocese and that he be allowed to carry out his ministry in peace," Mr Burke said. Catholics who have been seeking news of the bishop fear that he may be being pressured by the authorities to pledge his allegiance to the Communist Party instead of the Vatican.